This is a reference to an obscure 1966 Wistar Institute symposium which became famous in creationist circles (just read the 2000+ google hits on “wistar creationism”) for allegedly being the place where mathematicians demonstrated the unworkability of evolution by natural selection. If one actually reads the conference transcript, one realizes that what really happened was that approximately two befuddled math/computer science people, Murray Eden and Marcel-Paul Schützenberger (who was later a longtime friend/collaborator of David Berlinski, by the way), were schooled in basic population genetics & evolutionary theory by the likes of Ernst Mayr and Sewall Wright. It makes hilarious reading, along the lines of “we biologists worked out this math 40 years ago, why haven’t you read up on it” and “I can’t get my particular evolution simulation to work on my 1960s-era computer, therefore something is wrong with evolutionary theory!” The central misunderstandings from the mathematician side involved, as always, the same old dumb “but it’s impossible/extremely improbable for these sequences to come together all at once by random chance!” argument, which ignores (as always) the elemental point that evolutionary theory is the exact opposite of all-at-once-by-chance assembly. Anyway, intelligent design, being creationism relabeled, inherited creation science’s fascination with the 1966 Wistar Symposium, and for years IDists passed around the same old creationist talking points about it. Apparently they liked it so much that they decided to organize a 40-year retrospective meeting, and although it wasn’t sponsored by Wistar or the Gordon Foundation, somehow or other they got a number of serious scientists – not many with serious experience with the ID movement, though, as far as I can tell – to attend and spend a few days listening to ID propaganda. It appears that they had the help of Bruce Weber and maybe Scott Turner, about the only two biologists I know of who have the saintlike patience required to remain uncynical about ID advocates and their claims to be (a) doing science, (b) not creationists, etc. Anyway, it is evident that the mainstream scientists at the meeting were less than impressed, which perhaps is why we’ve heard nothing about this meeting until now. The reaction of Gunter Wagner, in particular, is interesting, since for years he has been quoted out of context by the ID movement to make it seem like he thinks evolution is on its last legs and going to expire real-soon-now. Brooks was one of these attendees and has written an entertaining account of the meeting and of the ID presentations, along with his thoughts on the meeting. I post his text with original formatting; I have added a few headings in [brackets] to increase readability in blog format. I have suggested to Brooks that he might prefer to respond to questions in the blog comments, rather than having a bunch of people send him email, but it is his call on whether or not he wants to do this. On November 18, 2006, I received an email invitation from a long-time friend and colleague, Bruce Weber. He was excited about the fact that he had been asked to co-organize a conference to mark the 40th anniversary of a Wistar Institute symposium, sponsored by the famous Gordon Foundation, called “Mathematical Challenges to the Neo-Darwinian Interpretation of Evolution.” The 2007 conference was to be a retrospective on that conference, called “Emergence vs. Design.” That final bit did not bode well, but Gordon Foundation conferences are prestigious events and Bruce felt it was necessary to engage Intelligent Design advocates, mostly in an effort to try to clarify which concerns were truly objections to Darwinian Evolution and which were objections to the version of neo-Darwinism Stephen J. Gould called the “hardened synthesis” and Niles Eldredge has called “hyper-Darwinism.” Bruce was inviting leading theoreticians who had been involved in efforts to bring concepts of systems theory, complexity theory, hierarchy theory, information theory and self-organization into mainstream evolutionary biology. I suggested a number of people, including Niles Eldredge. I was a little perplexed to see he had not been invited. On January 12, 2007, I received an email from Niles, inviting me to be a member of the editorial board of Evolution: Education and Outreach. Only at an editorial board meeting in New Orleans the first weekend in March did I begin to understand the potential significance of a Gordon Conference that took ID seriously. Like most university-based evolutionary biologists, I had taken very little notice of the ID phenomenon, and once the appropriate verdict was made in the Dover trial, I tuned out. As I learned more about the upcoming meeting, I became aware that we were trapped in a no-win situation. If we did not appear, the ID advocates would declare unilateral victory. If we did appear, they would claim that they were on equal footing with us, and would claim victory as well. How had this become a sponsored event by the Gordon Foundation? Despite some trepidation, I decided to attend. I am glad I did. First, the good news. I learned upon arriving that the only connection between this conference and a real Gordon Conference was that is was being held in Boston, the ID co-organizer is named Bruce Gordon (no relation so far as I know) and the conference was being called a retrospective on the 1966 meeting. This was reassuring – the real Gordon Foundation was spending its money on relevant scientific issues rather than this. Now the bad news. A few days after the meeting ended, we all received an email stating that the ID people considered the conference a private meeting, and did not want any of us to discuss it, blog it, or publish anything about it. They said they had no intention of posting anything from the conference on the Discovery Institute’s web site (the entire proceedings were recorded). They claimed they would have some announcement at the time of the publication of the edited volume of presentations, in about a year, and wanted all of us to wait until then to say anything. These actions made me aware of the extent to which the ID movement was willing to bear false witness in order to achieve its goals, and that kept me from falling prey to my empathy for the underdog. The conference had given me a chance to listen to the top guns of the ID movement expound their views. That helped me organize my understanding of their program and formulate my reactions, which I summarize below. Finally, I am most appreciative of the fact that Bruce Weber’s invitees were so interesting. They formed a second symposium discussing intriguing glimpses into the cutting edge of current evolutionary theory. What I present below is not a transcript of the proceedings, and if I report something that is factually incorrect, I am happy to stand corrected by an unedited recorded version of events. At the same time, many of us said things entre nous that we did not voice in public, so the recorded transcript is by no means the entire text of the proceedings. What I report herein is a distillation of notes I took during the presentations, and thus records my impressions of what seemed most important at the time. I have tried to give people the benefit of the doubt, mostly because I do not want to appear to demonize the ID presenters to the same extent as they tended to demonize evolutionists. But demonizing evolutionists, as opposed to disagreeing with them, is such a common aspect of ID that it seems to be a necessary part of the program. So, when I was most offended by mindless aggression, I wrote it down. I also warn the reader that I am still angry about being lied to, and no doubt that anger creeps into this report. The first session was entitled Theoretical Perspectives (Framework). Meyer stated early in his talk that ID is the idea that certain features of biological systems are best or better explained by an intelligent cause rather than random processes. Certain features of biological systems are diagnostic of intelligence guiding the process. One of these is the concept of irreducible complexity. Another is what he called specified complexity, which he equated with information. At this point, I was tempted to ask why the intelligence was so preoccupied with beetle information, but that would have been flippant and the ID people were very preoccupied with being taken seriously. Meyer next stated that Darwin laid down the practical rules for historical inference, but that historical inferences are not real science. This is because they involve abduction, or reasoning from effects to causes. By real science, Meyer meant deductive reasoning, from causes to effects. He then claimed that scientists and philosophers all agree about the causal inadequacy of historical inference. Therefore, historical explanations can only illuminate arguments based on plausibility, they cannot provide causal explanations. Meyer then admitted that ID reasons from the existence of present-day design to a Designer. However, he claimed that they should be required only to satisfy a burden of plausibility, not a burden of proof, since that is all Darwinian reasoning can produce. He stated parenthetically that they are not necessarily against evolution, they just think it’s not the whole story. This position is based on a misunderstanding of how historical inference is used in scientific research, which I will discuss later. For the moment, I will just point out that Dr. Meyer has a published record of misrepresenting historical inference in evolution (see Statement from the Council of the Biological Society of Washington at www.biolsocwash.org). Next, Meyer claimed that ID relies on the principle of uniformitarianism, but his version of uniformitarianism is that causes operating today comprise the realm of those causes operating in the past. He then got to a core issue of ID, stating that the origin of biological information is perhaps the greatest issue to be resolved. He asserted that new information is needed to build new forms. I would point out that Meyers defines information as improbability and the kind of information he speaks about is sequence specific information, defined as being so improbable that intelligent agents must have produced it. He uses this argument to claim that the Cambrian explosion requires ID because it happened too fast for Darwinian processes. The only support for this view is his article in the Proceedings of the Biological Society of Washington, based on his definition of Darwinian processes, one used uniformly and exclusively by the ID speakers at the conference. For them, Darwinian/neo-Darwinian processes involve the following elements: (1) mathematically randomly produced variation in the smallest elements of biological systems, (2) such variation produced in an incremental manner (their version of gradualism), (3) each incremental variant necessarily being functional and also functionally superior to the previous version, (4) environmental selection (which they equated with natural selection) being the only organizing force in the process. Simply put, the ID take on this caricature is that there has not been enough time for random variation on such a small scale to be designed by natural selection into the well-designed, machine-like perfection they claim we see today. 1. Conscious intelligent agents exist in the world. 2. These agents have causal and discernible powers. 3. These agents use their powers to have discernible effects- including irreducible or integrated complexity, complex digital and sequence information. At this point, science demands that these agents be identified so they can be studied empirically. Unfortunately for the IDers, the only such agents identified by Meyer and the other ID speakers were humans. Using their own brand of uniformitarianism, we must conclude that only humans are such agents, and yet ID proponents do not conclude that humans produced the worlds’ biodiversity. 4. The creation of new information is habitually associated with conscious activity. In making this statement, Meyer did not specifically state that only conscious activity could create new information, in a manner similar to Dawkins’ statement in which Dawkins did not actually say that there is design in nature. He also did not point out that DNA is a digital information molecule. This is critical, because they do not say that all DNA is designed, even though all DNA is a digital replicator. By their own admission, not all information is designed; therefore information per sé cannot be defined as improbability of a magnitude so great that only design could account for it. Meyer claimed that “conscious and intelligent” means what it is about ourselves that we understand to be true – we are conscious and intelligent causal agents, ergo we have been made by a conscious and intelligent causal agent. Using self-understanding as the basis of your theory for a Designer of the entire world sounded to some as if God were being made in human image, a key form of hubris in many religious traditions. Furthermore, Meyer claimed that the Designer works through evolutionary processes. So, their Designer has the same properties as evolution, except the Designer’s causal powers are more similar to ours than to those of natural processes. If the Designer is God, that sounds like a demotion to me. In addition, I see nothing in the argument that requires mutations to be guided by an intelligence that knows where it’s going ahead of time. 5. Some of the same effects are found in biological systems. 6. Top-down causation (Design) provides a possible explanation for these effects. Similar effects do not necessarily imply a common origin; that is only one possibility, but it is a possibility. 7. Bottom-up (natural, or evolutionary) processes cannot explain the biological phenomena that ID explains. The fact that one may find alternative explanations unpleasant does not make them untrue. In his landmark book, Science as a Process (Chicago, 1988), David Hull pointed out that one characteristic of academic disputes is that your side can always know what it needs to know while your opponent’s side can never know what it needs to know. This leads to pointless name-calling, straw man-building and personal conflict. Many scientists would say that top-down causation does not provide an explanation of the phenomena that ID claims to explain. Impasse. This point does nothing to illuminate either side. Science has to be more than an endless cycle of verbal jabs. 8. ID is the best explanation. This would be a valid inference if propositions 1-4 and 6-7 were not all fatally flawed. But they are. 1. Uniform experience shows that only intelligent agents generate large infusions of new info. This statement is factually untrue. 2 - Successful evolutionary models require intelligent input from humans. This is trivially true. In fact, unsuccessful evolutionary models require intelligent input from humans. This represents a profound misunderstanding, deliberate or ignorant, of the role of models in science. Scientific models are powerful in direct proportion to how easily they can be overturned by material evidence. Modellers expect their models to require modification based on empirical data. In science, a model that cannot fail is useless. 4 - Ribozyme engineering requires engineers. Note that conclusions 2-4 are three more statements about humans attempting to mimic biological processes. They are not relevant to any discussion of how non-human agents (natural or supernatural) might have produced those same processes. 5 - Layered informational hierarchies arise only from intelligent agents. This statement is factually untrue. Darwin wrote that he felt that phylogeny (the Tree of Life) was the relationship taxonomists had been unconsciously documenting in their (pre-Darwinian) classifications. Likewise, I think it is possible that human engineers, especially those working with machines that mimic organic functions, are trying to engineer in a very short time what evolution has produced over 4 billion years. So, rather than suggesting that God creates new information in the same way humans do, why do we not say that humans produce new information the way living systems produce it. Then we can ask how the natural production of information and the human production of information might differ. If I were a devout believer in a true Deity, I would expect that our efforts to engineer biological information and biological systems would pale by comparison with the evolutionary panorama. If we are matching or exceeding the Designer, it would be difficult to believe in his/her/its omnipotence (depending on the size of one’s ego, of course). John Collier asked, since Meyer stated several times that IDers do not question neo-Darwinism and believe ID could function through natural processes, what causes from ID could cause evolution. Meyer’s response was that IDers don’t necessarily think evolution happened. And finally, it is time for them to retire the assertion that ID wins over evolution on the basis that “There is not enough information in any given microbe right now to generate all the rest of the species on the planet.” This is silly, and does not help their cause. It is trivially true that no contemporary microbe frozen in time and space contains all the genetic diversity of all the species on this planet. But evolution is about descent with modification and neither descent nor modification play any role in the ID discussions. Using their reasoning, I have no daughter because there’s not enough information in me to generate her. That does not mean she was produced by the intervention of a supernatural designer. It is true that during the mechanical process that produced her, I may have invoked the name of the Deity at the height of ecstasy. But I know who was in the room at the time of conception, and my daughter is a wonderful combination of the material traits of both of those people, in addition to having many wonderful traits of her own, some of which appear in her children. I personally do not want ID to take away that strong sense of personal connection among the generations. The second section in the conference was entitled Are There Limits to Macroevolution? I was never able to understand the title, even though my presentation was assigned to that section. The session led off with Doug Axe’s presentation, “The Language of Proteins – Revisiting a Classic Metaphor with the Benefit of New Technology.” After the requisite testifying (I used to be an evolutionist until I saw the light), Axe gave a talk focusing primarily on a computer program for proteomics that his company has produced, and presumably is trying to market. The only connection between ID and this presentation were some statements meant to show that because lots of mutations do not destroy whole genomes, genomes have been designed to withstand mutations. If you look at molecular functions outside of their organic context, they appear so improbable that they must have been designed. He stated that laboratory studies can degrade enzymes and still get 25% functional neutrality. To him, this means that you need 25% change at every sequence position to get this effect naturally, and (once again, so boring) there has not been enough time for the slow, slow Darwinian processes to have produced these results. Here’s the problem with this view. Axe likened mutations to typos in a sentence, treating them as additive. And, if that were the whole story, then there might not have been enough time for what we see to occur by natural processes. But Axe makes two factual errors. The first is that proteins do not exist or function on their own, so they are not additive. Rather, they function in a complex living environment made up of hierarchically organized structure and function. With few exceptions, sequence alignments have shown that there is minimal conservation at the level of individual sites and increasing conservation at higher levels. The second factual error is that neither Darwinism nor neo-Darwinism requires rates of protein change to be slow, consistent, gradual or additive. Darwin’s wrote, in Origin of Species, that overall evolutionary changes would likely be incremental because they are the net outcome of a multitude of selection vectors affecting different aspects of the structure and function of organisms in different ways. This does not require incremental, slow change in the origin of novelty at any level. At this point I was asking myself what this presentation had to do with how proteins were produced in the first place, and thus the conference question of design vs. emergence? Proteomics researchers mimic the macro-mutational process of protein evolution in the lab at an accelerated rate, produce novel proteins, and search for functional differences that have some economic value. Axe’s company has an online program producing analogies with primary and secondary structure and super-secondary structure, trying to link primary structure-based sequences to structural components of Chinese characters, using some sort of numerical assessment of the geometric correctness of the gene for the best-fitting Han character, then assessing the extent to which this points to novel functional proteins. This is based on the notion that similarity in structure means similarity in function. The program requires no input from theories of origins, either evolutionary or design. Axe attempted to make a connection with ID by stating that changes in protein design are meaningful if: 1. they don’t make the sequence meaningless; 2. they don’t diminish the meaning; 3. they enhance the meaning; 4. they construct an important new meaning. This attempt fails: replace “design” with “structure” and “meaningful” with “functional,” and we have standard proteomics. In the context of design vs. emergence, I thought an important proteomics question would be, “Why did the Designer not give us more than a relative handful of all possible proteins?” If they are simple enough compounds that we can synthesize them in our laboratories, then they certainly were not beyond the Designer’s capabilities. Were they withheld from us for a reason known to the Designer alone? Should IDers probe into secrets not revealed by the Designer? And what if some of these novel proteins are inserted into other living species, or even humans. Is this not the height of hubris, tinkering with the Designer’s Design? None of the ID advocates at this meeting saw any conflict between belief in a Designer and the idea of engineering life, including human life. There must be a reason why so few proteins occur naturally. Perhaps the Designer used only those necessary to produce life on this planet, and left the others for us to discover and play with, a sort of Easter egg hunt for humanity. As a scientist, I also see no problems with searching out novel proteins in an effort to enhance the human condition. But protein engineering does not address issues related to design, creation, emergence or evolution, so Axe’s presentation was irrelevant to the topic of the conference. One questioner pointed out that character order in Chinese is very important, so there is more redundancy and hierarchical structure in Chinese than in English. Axe responded by denouncing Mao’s efforts to simplify Chinese rather than answering the real question about redundancy. Another questioner asked about the possibility that his models are not independent of his assumptions. Axe responded by denouncing unnamed people who get the right answers before they produce their model and says he has no results because he did not do what these unnamed others do; he built his model before he had any results. Privately, some of us wondered who was the target marketing audience for a proteomics computer program based on Han ideographs. Some felt it was simply good capitalism, going after a large market. Others, noting Axe’s attack on Mao, wondered if there was as evangelical agenda hidden in the marketing. The next presentation in this section was by Michael Behe, entitled “Observational Data that Strongly Circumscribe the Role of Randomness in Molecular Evolution.” Behe is a biochemist at Lehigh University, whose department has put a formal disclaimer on its home page about his activities. He is the primary reference for the ID concept of irreducible complexity (which is rebranding the argument from design better articulated by Enlightenment philosophers), equated at this conference with irreducible integration. Irreducible complexity seems to be the principle that, “if I can’t figure it out how natural processes operate, it must have been designed in a manner I can understand.” Behe’s speaking style was highly polemical, consisting mostly of small snippets, almost sound bites. He began with the mandatory caricature of Darwinism, saying that random mutation is the key to Darwinism. He opined that common descent is interesting but trivial (this itself is an interesting assertion, as most IDers don’t accept common descent as an explanation for shared traits), and natural selection is interesting but quite modest, and trivial as well. He stated that Darwinism has no way of traversing evolutionary landscapes; Darwinian evolution is swell if you need one or two steps, but if you need more, you run into trouble. He stated that when “people” [not named] talk about evolution they always speak in terms of things getting more and more fit, but he takes “fit” in this sense to mean functional design and efficiency. He stated that the goal [of biology] is not just to find out if something is possible but whether it is biologically reasonable. He claimed that he was not saying Darwinian processes could not do these things, just that they do not do them. Darwinism is not reasonable, because it does not make things better. Behe’s dismissal of phylogeny and selection as trivial does not mean that he does not believe in them. Behe did not sound like a creationist when he accepted an evolutionary origin of humans; despite what he has written, he spoke of “the line of organisms leading to humans” and “the line of primates leading to humans.” As well, his introducer pointed out that Behe has 9 children (1 fewer than Darwin, but 1 more than Thomas Huxley, Darwin’s bulldog). If they were produced by the same mechanism as my daughter, it would seem that, whatever his religious beliefs, Behe has been hedging his bets by increasing his Darwinian fitness as much as possible. Nonetheless, given Behe’s dismissal of studies of phylogeny and selection as trivial, what does he thinks is interesting and important about biology? Well, he disparaged Darwin and his 19th century colleagues for not knowing very much about biology and especially about the foundations of life. He also stated that Darwin thought everything was simple and now we know it is complex. Behe said if it looks complex, it is complex. He then said that if it is complex, it must be designed. But that is not the only possible conclusion from the observation that living systems are complex. Anyone who has read Origin of Species knows that Darwin’s formal theoretical framework was complex in proportion to the complexity of the process and products of life. In fact, the complexity of Darwinism raised objections from traditional philosophers of science of the 19th and early 20th century, leading to several attempts to simplify evolutionary theory, including neo-Lamarckism, orthogenesis and the hardened synthesis. 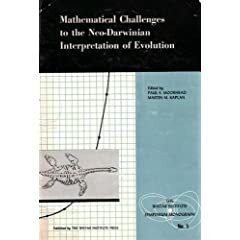 There is ample literature on this topic (for a recent readable summary and some key references about the complex formal structure of Darwinism, see Brooks and McLennan, 2002, The Nature of Diversity, University of Chicago Press, and Brooks and Hoberg, 2007, Evo. Edu. Outreach 1: 2-9), so there is no reason for Behe to make these claims other than poor basic scholarship. The crux of Behe’s perspective is that Darwinian processes are negative, degenerative and destructive. He claimed that Darwinian evolution takes place by degrading genes, because disabling a specific gene is >100 times easier than making a new one (a classic non-sequitur). He equated Darwinian evolution with Colombian drug lords blowing up bridges to keep government troops from coming in to clean them out, and with terrorists in Iraq. He equated Darwinism with an evolutionary arms race, which he likened to “trench warfare like in Iraq” (there has been no trench warfare in Iraq since the Iran-Iraq conflict, in which the US supported the Iraqis, even providing them with the chemical weapons of mass destruction that they eventually used on their own people). This was the first time we saw the bared fangs behind the smiles. Behe proceeded to parody two areas of evolutionary research. The first is a long-term set of experiments on selection and drift in E. coli supervised by Richard Lenski, a MacArthur Fellow, member of the US National Academy of Science and professor at Michigan State University. Behe decried the experiments for not doing something they were not designed to do. That is, he noted that none of the E. coli isolates in the experiments have evolved any new structures. He stated his opinion that Lenski’s experiments had shown evidence of parallel gene changes in various populations, but that none of those mutations/deletions occurred in order to benefit the population. Thus, Behe claimed that Lenski’s experiments provide empirical support for the notion that Darwinian processes are destructive, degenerative and degrading. Interestingly, Behe did not mention Lenski et al.’s simulations using AVIDA, which do produce complexity. The major problem with this is that Behe thinks Darwinians believe that any environmental stressor should produce lots of mutations in an effort to adapt to it. But this is more a Lamarckian than a Darwinian view, Darwin having been of the belief that, in the face of extreme environmental stressors, most things go extinct. It is true that some evolutionary biologists write and speak as if they believe environmental stressors will produce lots of mutations (some of which are bound to be beneficial) when they really mean that such stressors will produce lots of selection. Behe then moved on to chloroquine resistance in one of the species of human malaria, Plasmodium falciparum. Behe has written that the immune system is an example of irreducible complexity. It is possible he believes Darwinian processes have undermined the original design, so that we are no longer protected from, e.g. falciparum malaria, but he did not comment on that point. In that case, development of chloroquine would be a case of human agents attempting to repair the design punctured by Darwinian processes— implying a kind of evolutionary arms race, because now those nasty Darwinian processes have produced chloroquine resistance. How does the trivial thing called natural selection consistently override the design in the case of parasitic disease? Why did we have to develop chloroquine; why did the Designer not fix the designed apparatus? A skeptic might wonder if the designer cannot or will not counter all these Darwinian influences. Since something like 50% or more of the species on this planet are parasites, this is a question that would seem to require an answer on the part of IDers. Alternatively, one might ask IDers about the morality of humans trying to destroy one of the Designer’s species. How are we to know if falciparum malaria and the public health problems it causes are not part of a larger Design of which we are largely ignorant? Gunter Wagner characterized parasites as simple organisms living in simple and permissive environments, in which the loss of genetic structure should not be considered degenerative. The problem with this perspective is that parasites are more often more complex than their free-living relatives, and they live in some of the most complex and least permissive environments imaginable (for a good summary, see Brooks and McLennan, Parascript, Smithsonian Press, 1993). During one generation, a member of the trematode genus Haematoloechus will live in a mollusk, dealing with its immune system, will then spend some time free swimming in fresh water as a potential hors d’oeuvre for any planktivore, will then spend time encysted in a dragonfly naiad, dealing with its immune system, before being eaten by a frog, migrating to its lungs, and dealing with its immune system. So, what IS going on? Chloroquine is a highly toxic substance, so dosages for humans must be strong enough to kill the parasites but not the host; this means that in many cases the dosage will be sub-lethal for malaria. Chloroquine accumulates in the lipid storage vacuoles in cells, including red blood cells. When a malaria merozoite enters a red blood cell and begins digesting it, its activities release the stored chloroquine, which then accumulates in the merozoite’s excretory vacuole until it achieves a lethal level, and the organism dies. Chloroquine-resistant falciparum malaria merozoites have unusually high pumping rates in their excretory vacuoles. This suggests that they are simply mechanically better at de-toxifying themselves. Chloroquine has acted as a natural selector, filtering out those merozoites with a low pumping rate, and today we are left with a perfect example of natural selection in action. Selection has rapidly changed the frequencies of alleles because of pre-existing variation and a strong directional selection vector. The net result of our development of chloroquine has been that both humans and Plasmodium falciparum still survive. No matter how intelligently designed our efforts to destroy P. falciparum, evolution stays ahead of the game. We may be smarter but evolution has a 4 billion year head start. The final IDer presentation in this session was by Richard von Sternberg entitled, “Genomes, Formal Causes and Taxa.” He described himself a neo-Platonist and a Catholic, but professed to be uncertain as to whether or not he was a creationist. Sternberg is the former editor of the Proceedings of the Biological Society of Washington, fired for scientific misconduct after publishing Meyer’s unfortunate article. Sternberg discussed his belief that the nested sets in the phylogeny of life are not trivial, but also are not the result of evolution. Rather, he believes they are the result of the influence of highly self-stable ontogenies, producing morphotypes specified into what he called equivalence classes, which he believes characterize the major taxonomic groups. How these unique ontogenetic pathways emerge or are inserted into biology is uncertain to Sternberg, given that he rules out the historical accumulation of attributes (which he called frozen accidents and frozen accretions) as an explanation. The first ID presentation was by Robert Marks, entitled “The Need for Active Information in Evolutionary Search.” He began with blanket statements about “things from the evolutionary literature that have been pointed out to me by Bill [Dembski]…” That turned out to be mostly ad hominem attacks on Richard Dawkins. Marks described his approach as evolutionary computing, defined as searching through space looking for a known (also called targeted or pre-determined) conclusion. He presented a thought experiment, involving the Genesis creation myth, designed to show that if you know what you’re looking for, a random search for the solution is not very efficient (with the usual argumentation about tiny probabilities of anything happening at all and not enough time since the beginning of the universe for any outcome to have occurred randomly), but a search with additional information added is efficient. This was a blinding glimpse of the obvious, but it was also irrelevant, because biological evolution is not a process in which the system searches randomly for a pre-determined endpoint. As well, the search space is not static through time, with some of the changes in that space being the result of evolution itself. There is no hierarchical or contextual organization or function of the information in his program, which is based on a deterministic algorithm, despite the fact that evolution itself is indeterministic. Questions of search efficiency are the preoccupation of human agents called bio-engineers, preoccupied with mimicking natural processes and speeding them up to achieve human-time results. Engineers do not want anything to evolve, they want to make it now. They do not care how it came into existence, they only want to know if they can improve it. As with the case of Axe’s program for examining protein structure, there is no necessary connection between the research activities of this approach and the issue of design or evolution. So, how does evolutionary computing claim a link to ID? By treating organisms (or particular traits) as characters in something like a computer video game, where instructions from the player determine completely the activities of the characters. Marks spoke about his program’s target-motivated search world. He suggested that by keeping only “the fittest” at each step, his program could find the pre-determined endpoint quickly. He suggested that if this were done by natural means, it would be like having two children, killing one and keeping the other, then iterating the process. The program does not keep intermediate results, so historical accumulation of partial solutions is ruled out. That means you have only two choices - large numbers and randomness, which is inefficient, or large numbers and design, which requires external information. Marks called that “active information,” hence the “need” for active information in evolutionary searches. The astute reader will recognize that these are just Dawkinsian biomorphs, which Dawkins was careful to point out were only interactive toys to illustrate one aspect of selection, not actual evolutionary models. Marks then switched his ad hominem attack to Tom Schneider, an information theorist at the National Cancer Institute working on genomics screening for cancer. “Without going into the details…” Marks dismissed all of Schneider’s work by saying he introduces information into his models and claims he does not. What Marks did not say was that the “introduced information” in Schneider’s program is basic data, known genetic sequences. This is not the same as Marks’ active information. Marks then stated that once his group knew what Schneider had found after 40,000 iterations with his program, Marks’ program got the same answer in only 400 iterations. That would seem to make Schneider an agent of active information sensu Marks. For the IDers, this is not a problem, because they stipulate that the designing intelligence is human-like, which is the reason we can comprehend it. But in the case of criticizing Schneider, Marks’ position is tantamount to saying that a student can finish an exam faster if he has a copy of the answers beforehand. True, but not relevant. Gunter Wagner questioned Marks’ notion that evolution involves a target. Reacting to the obvious reductio ad absurdum, Marks became very belligerent and talked over Wagner, claiming that all artificial life simulations have a target. Before Wagner could respond, Behe piped up apparently on cue about Lenski’s work, and Marks replied, “Well correct if I’m wrong, but Lenski’s work did not work, right?” Wagner then stated that this criticism of Lenski’s work is unwarranted because prokaryotic microbes and the experimental environments that does not demand much of them – therefore, we should not be surprised that the evolutionary changes were small. Marks then asked Prof. Wagner if he believed that active information comes from the environment. Wagner agreed with this, and Marks seemed pleased, because he also believes active information comes from outside the living system. Wagner’s agreement would seem to make neo-Darwinism another argument from design. The problem is that Marks and Wagner were talking at cross purposes. “Active information” for Marks is whatever information is needed to make each embryo develop. “Active information” for Wagner is the influence of the filtering process that determines the kinds of organisms we see at any point in time. Wagner would agree that the active information sensu Marks does not come from the environment, but from the parents. This exchange kept Wagner from being able to respond to the ID claim that all artificial life simulations have a target, which is simply not true; anyone even vaguely familiar with artificial life research would know of the work by Alvaro Moreno and his group at the University of the Basque Country, and would know that they are focused on emergence, not design. Having a set run-time for simulations is not the same as having a pre-set target. Marks’s presentation was followed by one given by William Dembski entitled, “Conservation of Active Information in Evolutionary Search.” He began by demonizing David Sloan Wilson, author of Evolution for Everyone. Dembski claimed that the “no free lunch theorem,” should be adopted as a guiding principle for evolutionary computing as defined by Marks. He neglected to mention that the theorem was formulated by Wolpert and Macready, two evolutionists. Dembski interpreted NFLT to mean that if your algorithm is deterministic, you cannot generate new information and therefore if new information is needed, it must come from outside. NFL, according to Wolpert and Macready, says that no search strategy is better than random chance, when averaged over all possible fitness landscapes. Dembski did not elaborate the line of reasoning from Wolpert and Macready to his view. Rather, he illustrated his version of NFLT using a parable of a saint playing dice, in which one die came up 6 and the other split in two, one coming up 1 and the other coming up 6 for a total of 13, allowing the saint to win. Dembski claimed that this showed that the sacred must be included in a material way in producing new information, but I don’t think many Christians would consider cheating at dice, or any other material process, to be a solid basis for the sacred. He called evolutionary searches a form of the “needle in the haystack problem,” and claimed that the “Information Problem” in biology is one of trying to account for the successful searches. Claiming that “most biologists” believe it is a random process, and that random or blind searches for needle in the haystack problems cannot produce the life we see, Dembski concludes that life must be the result of an assisted search. He suggested that we can model the assisted search properly because the targets are implicit in our ability to understand the signs of design in the natural world. That is, the scope of the Designer’s work is the same as the scope of human understanding. Dembski ruled out inheritance as a source of the active information by claiming that this was simply a search for the search, which would lead to an infinite regress. Therefore, we should not look to inheritance as having played any part in the design. Thus, he concluded that we know a source of new, external, active information and it is intelligence. Furthermore, he concluded that God put the information into the system and challenged anyone to find a material alternative. He called this the theory of evolutionary informatics. I’m not sure it’s a theory, but I am sure it’s not science. John Collier observed that evolutionary informatics is based on the Aristotelian notion of a Prime Mover and assumes that information can only come from other information. How do you test this? If the information exists prior to the origin of life, it ought to be in the non-biotic realm and you should be looking for it. Have you or anyone else looked for this, and is there any evidence of it? For a world class philosopher, Collier was being quite gentle, so this must have been a critical point, because it provoked a decidedly ad hominem attack by Marks urging Collier to “Try to be more nimble in your thinking.” and…”I hope you were listening when I made a very convincing argument earlier in my talk…” Dembski then asserted that you can’t find empirical evidence of the Designer’s actions. Axe joined in, stating that the principle of Divine Simplicity is well entrenched in theology, and suggested, oxymoronically, that this means we cannot place any limits on God’s complexity. My recollection is that we broke for coffee almost immediately after that statement. Only one other time, in a roundtable discussion the last day, did I hear such direct invocation of supernatural principles. Gunter Wagner reiterated that John was only posing the problem and suggesting a test. The issue is where does the additional information come from; if, as IDers claim, the source of that information leaves no empirical trace, the issue cannot be investigated scientifically - ID is not science by the very words of its advocates. Bob Ulanowicz pointed out a mathematical inequality in Dembski’s model, implying non-conservation, and asked where the conservation comes from. Dembski answered that he just inserts that into the program himself. Bob followed up by asking if that meant Dembski was open to the idea of information being created and destroyed. Dembski replied that it’s like “a thermodynamic thing” but it’s also not “a second law thing.” With Bob Ulanowicz, me, John Collier and Jonathan Smith in the audience, Dembski may have been trying to change the subject. The difference between biology and engineering is that Life “makes it up as it goes along.” Organisms look like they know where they are going mostly because they “know” so much about where they have been as a result of inheritance from their parents – this is the sense in which common descent is the explanation for the mistaken appearance of design in living systems. There is no preset endpoint, so organisms and populations follow the line of least resistance in the environment through time. And if it does not know where it is going, it can get there much more efficiently in that manner than by being directed to a preset endpoint regardless of the environment. And finally, inheritance is not an infinite regress – it goes back only as far as the origin of life. Another parenthetical digression. The invited scientists included some of the real cutting edge information theorists, including Gregory Chaitin, whose formulation of algorithmic information theory cleared up the confusion surrounding the relationship between information and entropy, John Collier, whose foundational philosophical work on information theory is the leading edge, Jonathan Smith, the mathematician who provided the initial proof of the Brooks-Wiley dynamic proposing that information and entropy could increase simultaneously in evolution, and Robert Ulanowicz, whose work on the dynamics of ecosystems produced similar results. None of us exerted much effort to try to educate the IDers about the current state of information theory, beyond our own presentations, which were polar opposites of the IDers views. Nonetheless, it is true that many evolutionists are naïve about these issues, and some mainstream evolutionist accounts of information are so seriously flawed that a naïve IDer could get the wrong impression. The fourth session was entitled The Problem of Integrated Complexity. First scheduled in this session for the IDers was Scott Minnich, scheduled to give a talk entitled “Testing Competing Hypotheses for the Origin of the Bacterial Flagellar Motor and the Type III Secretory System: Co-option, Co-evolution or Aboriginal Design?” Minnich, however, did not appear at the conference, so Doug Axe read his paper. This began with the parody that natural selection was Darwin’s argument against design, that natural selection works on random variation in the smallest increments possible over the longest time intervals possible, and thus could not produce the finely-tuned machinelike, irreducibly complex parts of organisms we see today, and therefore Design is preferable to evolution. He clearly meant to parody natural selection, but in fact the parody is in the assertion that biological entities are finely-tuned, irreducibly complex machines. He also repeated Behe’s claim that all Darwinian processes are destructive. Thus, when portions of the flagellar apparatus occur by themselves in otherwise fully functional microbes, it is the result of degenerative evolution. The presentation included machine-like cartoons of the flagellar apparatus, but did not say they were cartoon representations. Here I was flabbergasted – I assumed this was a rhetorical stance, but some of these folks actually believe the machine metaphor to be the literal truth. News flash – flagella are not actually little machines (and sperm do not contain little homunculi). The talk concluded by trying to use a phylogenetic test to argue against one particular hypothesis, but displayed a marked lack of understanding of the way in which scientists use phylogenetic comparisons in testing evolutionary hypotheses. Specifically, phylogenetic comparisons can be powerful tools for falsifying some hypotheses, but are rarely sufficient, by themselves, for verifying any particular explanation (see Brooks & McLennan, 2002, The Nature of Diversity, University of Chicago Press). Thus, the fact that one hypothesis about the evolution of the flagellum is falsified by phylogenetic criteria does not mean that ID is the explanation. For example, Minnich did not even bring up the new study, recently published in PNAS, concerning the discovery of specific gene duplications that accounted for the cellular components necessary to make the flagellum. Nonetheless, when John Collier spoke about that study in his presentation the following day, none of the ID participants expressed any surprise (or interest) in the publication, which falsifies one of the icons of irreducible complexity. In fact, the IDers could have jumped on that study, which had serious flaws (see: /archives/2007/04/flagellum-evolu-3.html). Nonetheless, another study provides a natural explanation (see: /archives/2006/09/flagellum-evolu.html), so Collier’s point remains relevant, and unanswered. The next presentation in this session was by Ann Gauger, a microbiologist and employee of the Biologic Institute, whose presentation was entitled, “Assessing the difficulty of pathway evolution: an experimental test.” Her presentation was remarkable in part because she performed experiments and reported original data. She began with the repetitive attempt at a reductio ad absurdum, stating that the current complexity of metabolic pathways within cells could not have been created by gene duplication or gene recruitment (another name for co-option), and therefore they were designed. She suggested that contemporary evolutionists believe if there is not a payoff in terms of adaptive value within a few generations, any duplicated gene will be lost, and that for recruitment/co-option to work, function must change within a very few mutations. It is factually untrue that these assertions are an essential part of Darwinian theory. At most, they were initial starting points for investigations into protein evolution long ago, but today’s evolutionary biology does not adhere to any of them. Gene duplication is considered an integral part of evolutionary dynamics and one major source of the co-option that is so ubiquitous in evolution. She suggested that when similar proteins are “arranged by hierarchy,” the evidence suggests they arose from a common ancestor that predates the eukaryote/prokaryote split and perhaps even the Archaea. Gauger thus, like Behe, accepted not only a phylogeny of life but an ancient singular origin of life. Then she embarked on a series of experiments designed to emulate 2 billion years of microbial evolution in Petri dishes over a few bacterial generations. Specifically, she wanted to see if either of two forms of a protein would mutate directly into the other under those experimental conditions. They did not. Gunther Wagner congratulated Dr. Gauger on doing some great experimental work, but noted some logical inconsistencies in inference. The first is a phylogenetic comparative issue; it is necessary to know the ancestral state of the two proteins. If you are dealing with two proteins each derived separately from a common ancestor, then the experiment involves a minimum of two steps, backwards to the ancestral condition and then forwards to the alternative derived condition. It seems unlikely that you would be able to do that experimentally, especially if you have no idea of the environmental conditions under which the evolutionary diversification took place, and no idea if there were any intermediate forms that no longer survive. In response, Gauger admitted that the two proteins she studied are quite old and that studies of enzymes that are more recently diverged from each other report a lot of functional co-option, but only on a small scale. She was then prompted by one of her colleagues to regale us with some new experimental finds. She gave what amounted to a second presentation, during which she discussed “leaky growth,” in microbial colonies at high densities, leading to horizontal transfer of genetic information, and announced that under such conditions she had actually found a novel variant that seemed to lead to enhanced colony growth. Gunther Wagner said, “So, a beneficial mutation happened right in your lab?” at which point the moderator halted questioning. We shuffled off for a coffee break with the admission hanging in the air that natural processes could not only produce new information, they could produce beneficial new information. The fifth session was entitled Novel Evolutionary Mechanisms. Scott Turner, a professor in the Forestry department at SUNY College of Environmental Science and Forestry, Syracuse led off with, “Agents of Biological Design: Why Are Living Things Well-Crafted for the Things They Do?” Turner began with a statement from E.D. Cope’s 1887 collection of essays, Origin of the Fittest: Essays on Evolution and the Primary Factors of Organic Evolution, which was reviewed in American Naturalist the same year (Amer. Nat. 21: 465-467). Turner did not mention that Cope was a Lamarckian, instead emphasizing Cope’s statement that if Darwinism was survival of the fittest, it had failed to provide an answer to the question of the origin of the fittest. So by 1887, Spencer’s catchy but misleading characterization of Darwinism as “survival of the fittest” had already become a flash point for critics. And those critics included Darwinians as well, who deridingly called Spencerians such as August Weissmann, “neo-Darwinians” (for an excellent discussion, see Peter Bowler’s 1983 classic, The Eclipse of Darwinism). Turner’s presentation provided an excellent example of what Niles Eldredge has called the hyper-Darwinian mode, in which the distinction between Lamarckian and Darwinian processes is blurred. Turner described himself as a skeptical neo-Darwinist, saying neo-Darwinism is not wrong, just presumptuous. Like other speakers, he used blanket statements like, “The classical way of thinking about this is…” and “The neo-D view of this is….” without ever citing a source. He believes strongly in design and the machinelike nature of living systems; thus, he unapologetically used teleological language in his explanations. His perspective is that a gene sits in a machine, and requires a well-designed organism in order to replicate itself. At the same time, he did not accept the ID version of design, claiming that by claiming intelligence and consciousness as the source of design, ID is a form of Platonic essentialism. Nonetheless, he followed IDers such as Behe in ascribing anomalies and deficiencies to natural processes, and all positive functions to design. Turner made a Lamarckian-sounding statement when he claimed that hereditary memory is an illusion, yet did not claim that the design we observe results from an inner drive to adapt to local conditions, regardless of hereditary. Turner specializes in the study of social insects, particularly tropical mound-building termites. He defined Macrotermes mounds as designed organs of extended physiology (sort of colony-level lungs). He played a short piece of video about the structure and function of the mounds from one of David Attenborough’s documentaries, in which Attenborough consistently used assertions about the purpose of each thing in nature. Turner then asserted that natural functions, in particular homeostasis, are ipso facto evidence of design. Thus, if you find evidence of homeostasis, you may assume design and move directly to a search for the agent of that design. A wonderful metaphor, Dawkinsesque. But vacuous as a scientific explanation. A simpler explanation for the termites’ nest ventilation function is as the metabolic activities of the termites heat the air in the nests, that air rises, drawing cool air in from the surrounding soil, cooling the nest and refreshing the air. A questioner asked Turner in what way he could test or propose a test. Turner responded that one should stress the system to see the limits of its functions. The questioner replied that testing the limits of the function is not a test about the cause of the function. What about testing Turner’s notion that hereditary memory is an illusion? Turner sees replicators as different from and opposed to persistors, with replication an illusion and persistence due to design. It seems to me that there is a large amount of evidence of a causal relation between parental and offspring structural and functional phenotypes. If the same parents have one child in the desert and then another in the city, they will still resemble each other and their parents; the first will not be a desert organism and the second a city organism. The sixth session was entitled Epigenetics, Embryology, and Developmental Biology. The first ID presentation was by Paul Nelson, entitled, “Why Building Animals is Hard.” Nelson is a young earth creationist. His introductory ad hominem attacks were directed mostly at a shadowy group characterized as “academics. “ He claimed, for example, that you cannot find a university bookstore whose section on evolution does not include a majority of books that begin with a complaint about the inadequacies of neo-Darwinism, and yet the academics running the show at those universities teach only the orthodoxy. In this case, I know he was intentionally misrepresenting the truth, because when he introduced himself to me the first day of the conference, he told me that when he was a student at Northwestern in one of David Hull’s classes, he had to read Evolution as Entropy, not commonly thought of as an orthodox tract. He gave Francis Crick a partial pat on the back, saying that when he thought like a design theorist he did okay but when he thought about evolution, he went wrong. As a creationist, Nelson objected to both of Darwin’s theories, phylogeny and natural selection. He asserted that in order to “build an animal,” you have to have a developmental process pointing to (pre-targeted for) that animal beforehand. Once again, organisms are viewed as machines, with pre-targeted endpoints determining their origins, functions and outcomes. Clearly, the Designer is not interested in anything like Free Will – no creativity, no adaptability, no flexibility, just automaton-like behaviour. Ontogeny is a linear program of instructions like a machine assembly manual. Nelson used the nematode Caenorhabditis elegans as his exemplar. He began with a news report in Science about the first complete cell fate map for C. elegans. The title of the report was, “Why is development so illogical?” Nelson took this as a scientific assessment rather than dramatic license by the journalist and editor in an effort produce a catchy title that would pull readers into the story. What the journalist meant was, “Why is development in this nematode not simple and linear.” The answer was that development is highly non-linear, hierarchical and historical, and gives all appearances of having been assembled piecemeal over time rather than having been designed as a unit. Nelson only discussed the title of the piece, and certainly did not mention the primary research literature on which the item was based. He next set up another of the IDers improbability arguments. He claimed that we do not know much about cellular differentiation, and what we do know about it does not support evolution. He then said, don’t think about what is controlling this, don’t think about DNA or anything, just assume there are instruction rules; no hierarchy, no feedback, no context. Just assume there is a linear sequence of instructions, and assume that every metazoan begins as a single cell in an undifferentiated state. Then he went through a laborious description of each event in C. elegans ontogeny, claiming that the odds of getting any one of them is very low, so the odds of getting all of them together in one functioning ontogenetic program at random is even less likely, and so when you then consider all the kinds of ontogenetic programs, it must have all been designed. An irrelevant argument, since all the premises are factually incorrect. The real action in this presentation emerged from a question by Murray Eden, emeritus professor at MIT and one of the participants in the 1966 (real) Wistar Conference. Murray asked why the current view, that communication between cells at each time interval, each of which changes the conditions in which the developing embryo finds itself, which then prompts the next step, which then leads to new communications, and so on, could not explain all this. Nelson reiterated his position that the instruction set has to be a priori and complete, and ontogeny is a designed linear program of instructions producing a pre-determined outcome. This was followed by additional observations that Nelson’s view assumes that only the DNA is involved in development. This neglects what is going on inside the cell but outside the nucleus, as well as what is going on outside the cell. And that means you cannot address the issue of whether the instructions are conditional or determinate. And since each kind of extra-nuclear influence represents an environmental context for development, you cannot say that there is not enough natural dimensionality for ontogeny to occur without externally designed information being inserted in some manner. Nelson replied that you ‘cannot presuppose Mom’ in order to provide an evolutionary explanation for ontogeny. What does that mean, and why is it wrong? Let’s take a short detour through what we actually know about C. elegans reproduction and development. Fertilization in C. elegans is internal, meaning that the male’s sperm is transferred to the reproductive tract of the female, and finds its way to near the ovary where ripe unfertilized eggs have been released. Each of those unfertilized eggs is a complexly organized living system produced by the female (hereafter referred to as MOM, the shorthand acronym for “mother”). That system contains a haploid complement of genes organized into chromosomes, so that each gene is associated with other genes and each chromosome with other chromosomes, forming a genomic environment. That haploid genome is surrounded by a nuclear membrane which forms a boundary between the genome and the cytoplasm of the unfertilized egg and which acts as the immediate environment for the haploid genome. The cytoplasm of the unfertilized egg, itself a very complex system of organelles, some of which have their own genomes, constitutes the third environmental layer surrounding the haploid genome. This is all surrounded by a lipid bi-layer cell membrane, a fourth environmental layer that provides a boundary between the unfertilized egg and its surroundings. Those surroundings, the fifth layer of environment, is the lining of the oviduct. All five layers of environment are a priori to the development of the egg, and all are provided by MOM. After copulation, sperm interact with all five layers of environment, changing each one and thus the very conditions of life for the unfertilized egg. Fertilization itself produces a marked change in the innermost environment, where two haploid genomes, one produced by MOM and the other by the external agent we will call DAD (you figure that one out), fuse to form a new and unique diploid genome. This event affects each of the outer layers of environment, all of which were produced by MOM, and changes in those environments then provoke changes in the activities of the genome. At the same time, MOM responds to these changes by secreting yet another environmental layer, this time between the embryo and the lining of the maternal reproductive tract, called an egg shell. Mitosis and cell adhesion are among the built-in instructions, ensuring that once cell division begins, the new embryo itself will produce additional layers of environment. Once the embryo attains a certain number of cells, it will no longer be possible for all cells to be in physical contact, so the complex layers of environment become spatially partitioned and different, provoking different cellular responses in different parts of the embryo. Even the same genomic response can produce markedly different outcomes depending on spatial and temporal context. This is what Murray Eden was talking about – we know this happens, and we know that the multiple layers of environment were initially provided by MOM. At the risk of belaboring an earlier point, developing organisms look like they know where they are going mostly because they “know” so much about where they have been as a result of inheritance from their parents, especially MOM. There is no preset endpoint, organisms just follow the line of least resistance in their environments, the final outcome constrained but not determined fully by their inherited genomic and extragenomic information. So, it is true that information essential for proper development is not all contained in the DNA of the developing organism. But almost all of that extragenomic information comes from MOM. The information provided by MOM is historical and it is layered hierarchical information. In the first ID presentation of the conference, Meyer claimed that layered hierarchical information could only come from design, so for metazoans at least, we have identified the Designer, and it is MOM. If you don’t presuppose MOM, development not only looks impossible, it is impossible. The final ID presentation was by Jonathan Wells, “Designing an Embryo: Beyond Neo-Darwinism and Self-Organization.” Wells persisted in much the same vein as Nelson, claiming that the problem of ontogeny was getting a 3-dimensional organism from a 1-dimensional program, and that ontogeny is a process of sending an organism ahead to a pre-determined endpoint. His position is that the organism is contained in some way in the embryo in a way that is best explained as the result of conscious intent. He noted that in the 1966 (real) Wistar Conference, Lewontin said it would be possible to generate 3-dimensional organism from a 1-dimensional program, and that as recently as 1987, Watson et al. (1987) stated that ontogeny is written linearly in the base pairs. Real developmental biologists, the authors of the primary literature that none of the IDers ever cited, know this is not true; DNA is not 1-dimensional, and ontogeny is not just DNA. Not everything instructional is in the DNA of the nucleus because that is the same in all differentiated cells of an organism. He attributed the fact that the nuclear DNA is the same in each cell of the body to the Principle of Genomic Equivalence. Let’s not over-think this; the reason all my cells have the same DNA is because they are all descended from a single fertilized cell, not because some extra-biological agent placed the same DNA in each of my cells at each point in development. Again, as Darwin noted, simple inheritance is the primary explanation for similarities among organisms. Extragenomic information does not come from extra-biological sources. Having dismissed efforts to explain development from a purely genomic perspective, Wells then claimed that epigenetics is a neo-Darwinian concept because it is genic, and rejected that as well. From Waddington to Jablonka, however, developmental biologists have wondered if neo-Darwinism has become too reductionistic to encompass development fully, and have proposed ways to recapture the priority of the nature of the organism as emphasized by Darwin. A few facts notwithstanding, Wells then concluded that ID allows you to consider explanations in developmental biology that do not assume it is all in the DNA. Once again, correct inference except that the initial assumption that standard science assumes DNA exclusivity is false. Wells then discussed a number of interesting epigenetic phenomena that are well known: in vitro production of parthenogenic Xenopus using sperm with centrosomes but no nuclear DNA, the role of cortex (cytoplasm) structure in Drosophila embryogenesis; Homeotic genes. Wells would like all of these phenomena to be evidence of pre-targeted design elements, but they are not. The Xenopus and Drosophila experiments demonstrate the importance of the historical and purely biological environmental context provided by agent MOM, while homeobox genes are responsible for unlocking stored history. All of this research underscores the recognition that the “targets” are abductive, set by historical events in the inherited flow of intrinsic information. The notion of pre-targeted endpoints sensu Nelson and Wells (and Marks and Dembski) has relatively recent roots in Gnostic (Manichaean) concepts of Pre-destination, introduced into Protestant Christianity by John Calvin, and has long since been dropped by mainstream Calvinist denominations, such the Scottish Presbyterianism that I was brought up with. ID dooms itself. In their own words at this conference, IDers espouse a program in which the scope and power of the Designer is restricted to purely human dimensions, in which the effects of the Designer on biological diversity have left no discernible trace that can be detected scientifically, in which the effects of Darwinian processes are the only biological phenomena that can be studied scientifically, and in which Darwinian processes are overwhelmingly more powerful than those of the Designer (because they inevitably cause the Designer’s creations to degenerate). For example, it must be evil Darwinian processes that produce emerging infectious diseases, otherwise each pathogen would remain associated only with the host for which it was designed. This is all just too silly. So, there is no question that ID is not science, even though many adherents are, or at least were trained as, scientists. In addition, ID does not represent a real challenge between science and religion. I was prepared for all of this, because we’ve seen this movie before. Among enlightenment philosophers, Gottfried Leibniz (1646–1716) was instrumental in making the point that the explanation for any part of the universe that leaves no empirical mark is beyond reason and thus beyond the scope of science. Anything that is not beyond reason has to leave evidence of its existence - the designer must have left signs of design if we wish to consider ID science. Leibniz suggested, however, that asking for scientific evidence in matters of faith re-made God in our own image, thereby reducing His power and scope. Immanuel Kant (1724-1804) attempted to explain why humans consistently try to circumvent Leibniz’s dictum. He placed the blame on Imitatio Dei (ID), the desire to be God. Kant considered ID the source of all human discontent because it inevitably led to the diminution and disappearance of God, followed by complete loss of faith and utter hopelessness. Kant’s prescription that science and faith maintain themselves in separate spheres was based on his desire to preserve faith, not destroy it. Modern science educators have an explicit mandate to pass on the marvels of scientific discovery to each new generation while being neutral with respect to the faith-based beliefs of their students. Presenting ID in science classrooms, much less taking it seriously at all, violates that mandate.